I don’t know about you, but the thought of putting sandals on right about now seems like a really bad idea! My heels are such a problem. So, in the spirit of getting sandal ready, I thought we should make a super thick and luxurious foot cream! And… As an added bonus, we can add the essential oils, peppermint and tea tree for a cooling sensation and de-odorizing benefits. Olive Oil is one of my favorite oils to use in my homemade moisturizers and cleansers. It is so healthy for the skin! It is packed full of antioxidants and vitamins. Vitamin A is a healing and rebuilding vitamin found in olive oil. It helps your cells to repair and renew. So as you can see, it is super healing for broken, cracked heels. Not only is it healing, it is one of the most moisturizing oils. Plus, it’s probably sitting in your cupboard right now! Organic Extra Virgin Olive Oil that has been cold pressed is the best olive oil with the least processing, this is what I look for when using my olive oil on my skin and for cooking! Shea Butter is an amazingly rich butter that hydrates and nourishes the skin-it helps your skin to heal and repair. 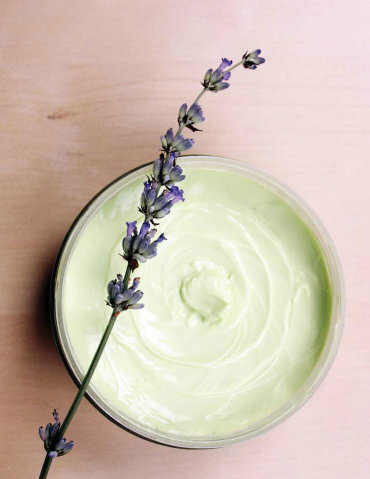 Adding Peppermint and Melaleuca (tea tree) oil takes this cream to the next level. Tea Tree it anti bacterial, anti fungal and antimicrobial. It is a very effective treatment for foot fungus and athlete’s foot. Peppermint is antiseptic. It helps to soothe and revive tired feet. It can neutralize odor as well as encourage circulation. I use peppermint oil on every ache and pain. It is amazing for headaches and cramps. Not only does it relieve and refresh, it also is very moisturizing!